This week the UK government announced a ban on all sales of conventional petrol and diesel vehicles in 2040. This move sends a clear statement of intent to EU policymakers, consumers, manufacturers and investors, but it is what happens in the intervening years that is critical. Phil Summerton, Managing Director of CE, says “The real benefit of this announcement, and the similar ban in France, is that it allows the EC to set CO2 standards for new vehicle emission rates in 2025 and 2030 that support a trajectory towards ultra-low emissions vehicles by 2040. The carbon emissions legislation which kicks in ahead of the ban will encourage the industry and governments to rise to the challenge. Is the 2040 timeline ambitious enough? This move by government guarantees huge local air quality improvements, carbon savings and economic benefits and some have questioned why the ban is not being introduced earlier. The share of low and zero-emission vehicles will rise rapidly in any case, supported by European legislation, as electric vehicles become more attractive to consumers with costs falling and battery range increasing. We have calculated vehicle stock emissions for a specified vehicle sales mix, using information on vehicle survival rates and new vehicle efficiency. 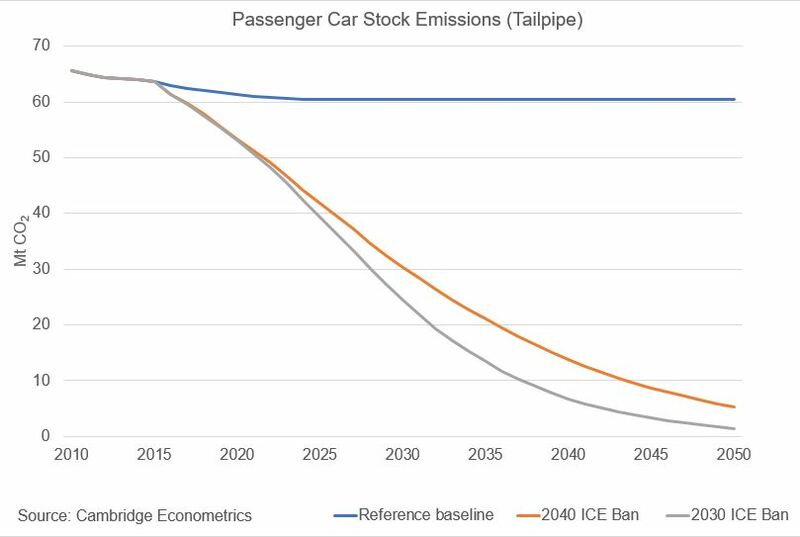 We calculate emissions reductions under three different scenarios: a baseline with no change to the vehicle sales mix, a 2030 ban on conventional petrol and diesel cars, and a 2040 ban on conventional petrol and diesel cars. The figures show that a 2030 ban would save an extra 156MtCO2 by 2050, compared with the 2040 ban announced this week. It could be argued that the additional 5-10MtCO2 carbon savings each year is worth bringing the ban forward to 2030. However, the faster the transition, the more rapidly the transition challenges would need to be addressed by policy makers. The transition to ultra-low emission vehicles is not comparable to the launch of other technology products, such as smartphones – as some commentators have alluded to. The infrastructure, employment and energy system challenges are considerable. 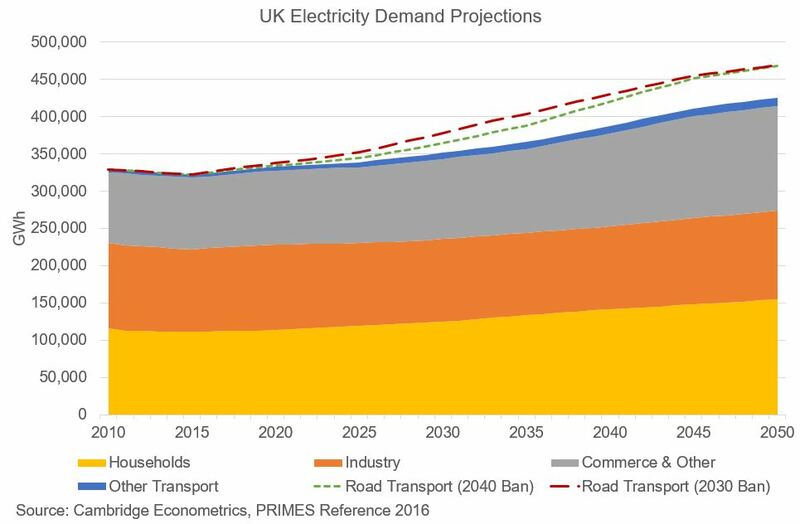 Our analysis shows that fears over how the electricity grid will cope with the move to all electric vehicles are misplaced. Electric vehicles would lead to an increase in electricity demand of only 10% by 2040. One of the reasons for the misplaced fear over electricity demand is the assumption that electric vehicles use power in the same way as a conventional ICE (internal combustion engine), but ICE’s are significantly less efficient that an electric battery at transforming power to forward propulsion. Instead the concern should be focussed on delivering electricity at peak times of the day. Commuter patterns suggest that many drivers will charge their cars after returning from work exacerbating the problem of meeting peak load demand. As the UK’s electricity system moves towards intermittent renewables there could be power outages as the grid struggles to meet peak demand. Evidence from our research with Element Energy on the French electricity system suggests that the challenge could be overcome through smart charging, but this requires smart charging infrastructure to be installed alongside the roll-out of EVs. Smart charging would also help reduce the investment required to support the distribution network in providing the additional power to homes at peak times. 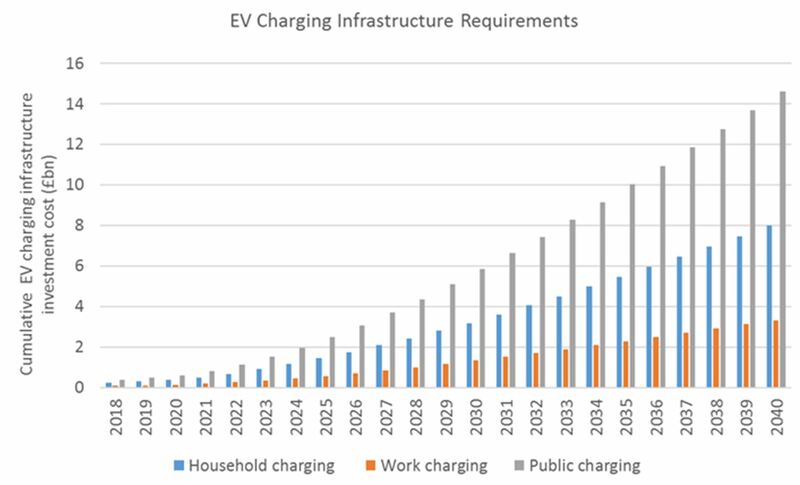 For a rapid uptake of EVs, in line with that required to meet the government’s 2040 targets, investment in charging infrastructure needs to be accelerated. The implementation of an extensive charging infrastructure in the UK will cost around £25bn by 2040 (of which around £15bn is required for public charging infrastructure). For EV charging infrastructure capabilities to meet society’s needs, a determined and joint effort between industry, government and civil society is required. Electricity grids will need to be reinforced and modernized but these costs could be reduced if smart charging initiatives are rolled out to balance peak electricity demand. The pathway to 2040 is more important than the end point. Recent remarks from Greg Clark have identified the Automotive Council, a partnership between the public and private sector, as the model for stakeholder partnership and the development of industrial strategy. 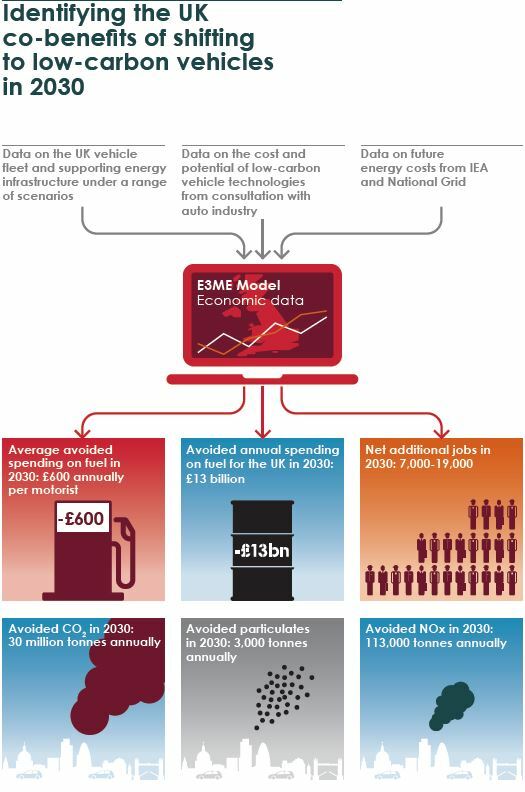 Over the next decade, this institutional arrangement will be put to the test: can the UK manufacturing sector rise to the challenge of developing and manufacturing ultra-low emission vehicles? Will inward investors be encouraged to set up shop here, despite the uncertainties caused by Brexit? Will the manufacturing sector and supply chain have enough trained individuals to deliver the parts and finished product? How can specialised and skilled labour transition from manufacturing internal combustion engines to advanced powertrains and how should government support such a transition? Whether and how to tax motorists to recoup lost fuel duty revenues?